I really wanted a sampler, probably too badly. I bought this one used, for what I should have known was too cheap. The S-220 does what it should, samples a t aprimitive 15 or 30 Khz, for a max of 4.4 sec,s. But when it comes to edit the sampled sound, it's difficult and limited (eg. there are four differnent kind of auto loops but htere is no explanation of what the difference is between them, and the little experimenting I did they all seemed the same !!). the limited time is a bit exasperating as well, but the biggest downfall is the quck disk. These only store one sound a side ( If you are loading all four tone banks this becomes tedious) and more importantly have gone the way of the Dodo. I have yet to see any of these disks for sale anywhere. I'm glad whoever sold this unit sold it with a lot of disks. 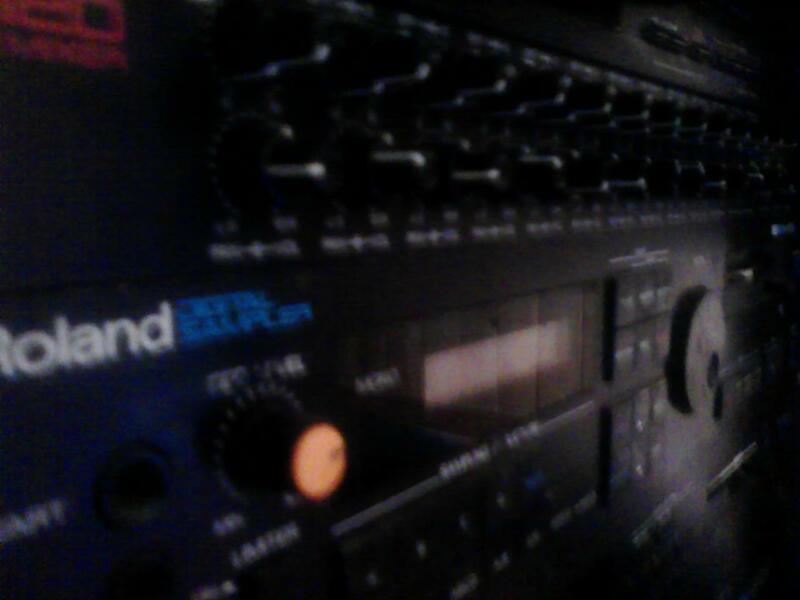 I did use this for a while, I was in a three piece and used it for a sampled bass sound, but it didn't travel well. Too many gravel roads and dirty clubs clogged the disk drive and killed a few disks so I had to retire it. After sitting in a relitively dust free environment the junk worked itself out of the drive and it worked fine. Another thing to note is this was made back when Roland made buttons that worked for longer than a year. All in all it is limited but can be o.k. just make sure there are lots of disks with it! feb 2004 - Replaced the quick drive with the one from the PR-100,although it won't load every time at least it works most of the time (maybe it's also because the disks are 17 years old). And the funny thing is the other drive seems to work in the PR-100! may 2004 - after consulting the Sgroup gurus I found out my drive was out of alignment, and after much thought, I have not realigned the drive currently in the s-220 but managed to grab the last of the elusive samples I had been unable to retrive before. I aligned the other drive and temporarily swaped them. 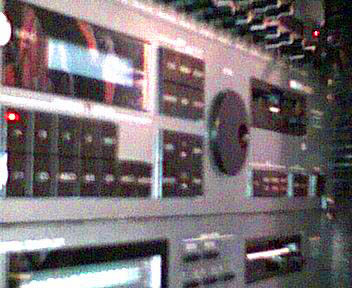 I have saved all my samples on computer and as I need them I can throw them on QD's (even if the drive is out a bit, what it records, it will read.) I just have to fix a few things I had overlooked until now like a nasty ground buzz and the broken volume knob. Nov 2015 - After letting everything sit for a long time I finally hooked most of it back up and quickly found out there was a problem with the S-220. For some reason everything is about 50 cents flat, just enough to notice and make everything sound bad. I am not sure what is causing this, but I guess I will have to open it and attempt a fix. I opened it up to fix it and it found I was really at a loss, I did check a couple of things I thought might be causing problems but they all seemed fine. I put it back together and then everything was fine. Wierd. electronically There is a ground buzz and the volume knob is broken. 2016: Sorted out many of the disks last year. Aside from the curious tuning problem, it all seems good. Still set up in rack 1. 2012:Set up and in the rack. When I have time I would like to organize the samples a bit better, there are hundreds sitting on a back-up CD somewhere. 2008: I at the moment have it set up in my dining room! I am gearing up for a live Beker show, and am practicing as much as possible. I want to buy a USB MIDI device so I can go through samples again, soon! Maybe I should look for some more QD's. 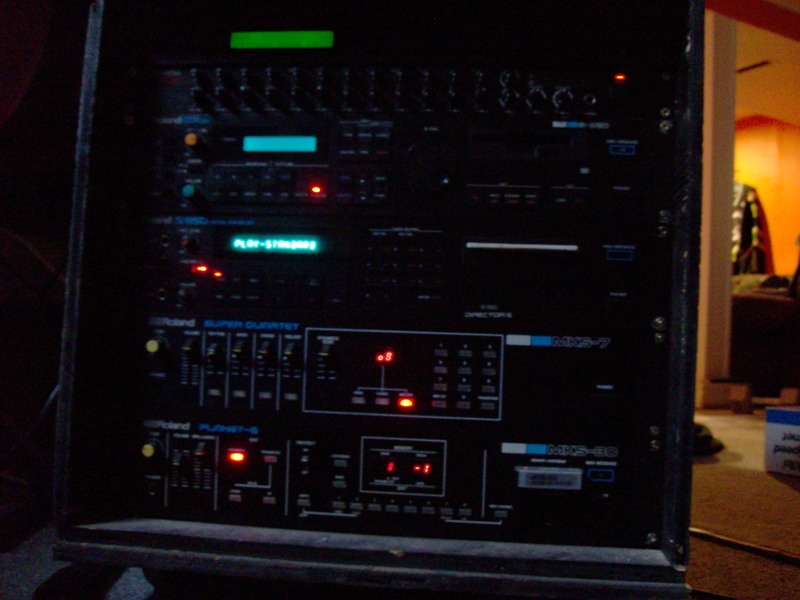 2006: I still love this little unit, I have tons of cool samples. I know when I have the room it will go back in the house! Sgroup- users group dedicated to s series samplers, they now have a s-10 section that has all the Roland samples, the L'il chips samples & and many more!! S-220 site - has a few items of interest, like a manual if you need it.